"Extremely interesting and interactive - loved it all"
"Discovering that it worked instantaneously!! 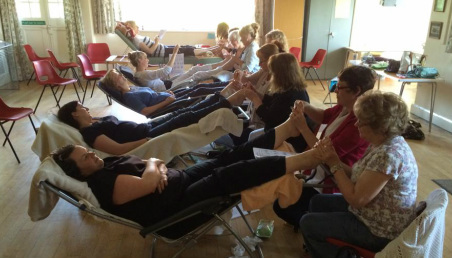 didn't realise I had an issue with my post surgery, but the instantaneous results made me realise what an issue it was"
"Thank you Sally, best course I've ever been on, I learned so much"
"I enjoyed every part - it was excellent"
"Every reflexologist should take this course"
"Loved learning about this therapy and cannot wait to use it"
"A great balance between practice and theory"
"Thank you for such a brilliant course"
"Down to earth, approachable tutor"
"Very well explained! Thank you Sally you are inspirational!" Thoroughly taught, enjoyed it very much, learnt a lot! Enjoyed it all, so interesting! As a Lymphoedema Nurse Specialist, I was particularly interested to hear Sally Kay present her research relating her approach to reflexology and lymphoedema. · Six people who all showed an amazing loss of fluid after their four treatments. 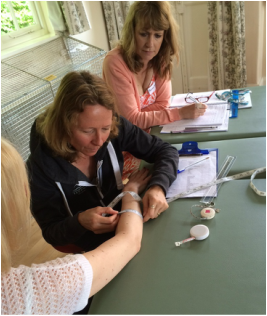 I thought this was such exciting work- considering the number of people that are affected with lymphoedema and that working on the feet would be much less invasive for MLD therapy. 'This was interesting from start to finish'. Anecdotal evidence and feedback from reflexologists who are using RLD, suggest it may also be helpful when treating clients with symptoms of other conditions, such as ME, fibromyalgia, lethargy, migraine, pre-menstrual fluid retention and sluggishness.